In a large bowl, toss together the fresh chopped coriander with the leftover cooked rice and drizzle with a good hit of fresh lime juice. Heat in the microwave or on the stove just until hot, and give it a quick stir. In a large frying pan, sauté the onion and garlic in a little oil for 2 to 3 minutes, or until the onion is soft. Reduce the heat, add the beans and season with the chili powder, cumin, and hot sauce, give it a little stir, add a little seasoning to taste. Allow the beans to heat through for about 5 minutes. 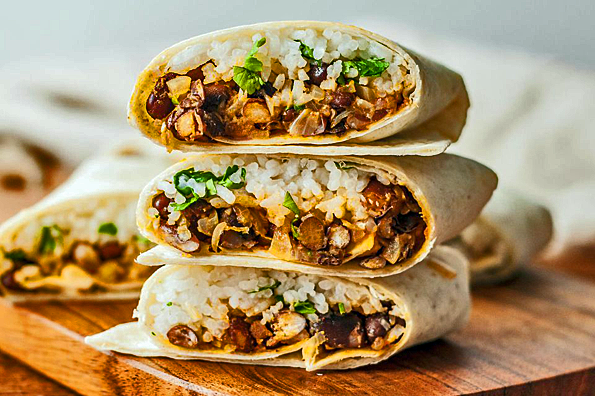 Spoon the coriander lime rice and the black beans onto warmed flour tortillas, and add any extra toppings you like, salsa, avocado slices, guacamole, black olives or some non dairy sour cream or cheese.